Find any imperfection in my surroundings (boulders, creek-bed) and try to wedge myself between / below it. Okay - I found that both my Langmuir (Mountaincraft and Leadership) and my Mountaineers (Mountaineering: The Freedom of the Hills) have pretty good advice about lightning. I would advise anyone planning on heading out into the hills to read both of these excellent books - Langmuir is the book for British Mountain Leader Training, and the Mountaineers covers a lot extra information for activities over in North America. I don't think being away from the treeline is particular problematic (unless you are the only thing on a very flat piece of ground). As long as you are not on the top of a ridge/hill, then there is a safe "shadow zone" on the side of the hill - I think something of the order of 2/3 of the way between the hilltop and its base. The only thing is - you should sit on top of a plastic sheet or your backpack to prevent picking up stray eddy currents from the ground. You can get a shadow from a 7m or taller cliff where the safe zone is between 3m from the base out to the height of the cliff - this means standing 5m from a 7m cliff should reduce your chance of a lightning strike (note - reduce - there is still a chance you can get hit, there is no 0%). There is a diagram on page 227 of 3rd Edition - I can't find one to link to, unfortunately. He doesn't say how steep the cliff should be, though. If you enter a cave for shelter (or dive under a boulder) - you must have at least 3m head room (so - 5m total) and 1m to either side. Here is the position the Boy Scouts of America teaches boys to use when in this situation. 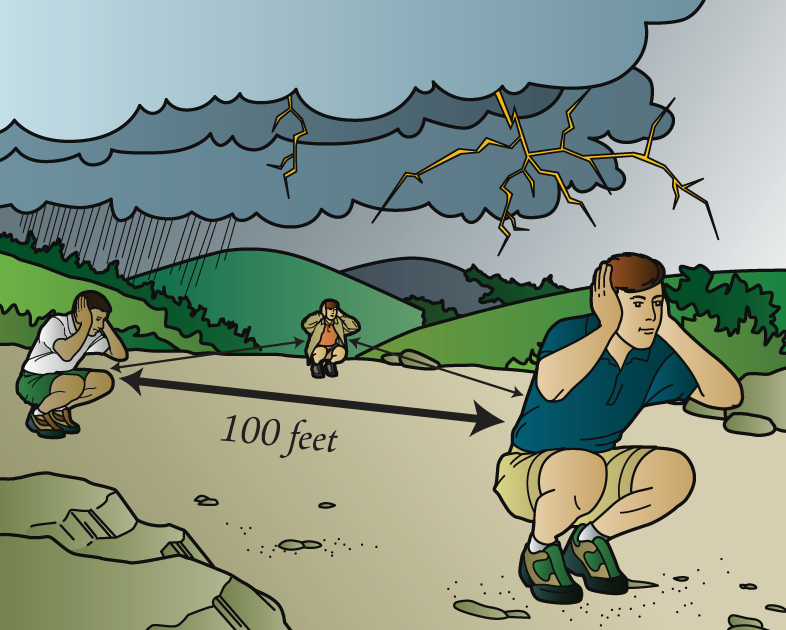 If a lightning storm catches your group in the open, spread out so that people are at least 100 feet from one another. Further limit your risk by crouching low with only the soles of your shoes touching the ground, and take off your hat if it has any metal parts. You can also use your sleeping pad for insulation by folding it and crouching upon it. From the BSA handbook 12th edition. Cracks in rocks or lying on the ground won't improve things. Creek beds might make it worse if there's enough water to conduct electricity. The best policy is to get down before the lightning starts. Moving to the trees is probably the second best bet. Look around and see if a bunch of trees in your area have been struck over the years. If so, you're in a bad place. I remember reading a scientific report they did in Colorado with a lighting strike detector in some mountain thunderstorms. They found that the downwind slope of a mountain has more lighting strikes on average than the peak or the upwind slope. I don't remember who did that. It depends a bit on your circumstance, but it's fair to say that the 3 options you provided would each be okay, given the right circumstance. Finding an imperfection is probably your best bet. Just make sure it's not next to the highest thing around, or you could be in trouble. Lying flat is a bad idea, as the ground will conduct into you. Better would be to get into a position where you are as low to the ground as you can get with only your shoes touching the ground. I would lay down your backpack and crouch on top of it. The backpack combined with your hiking boots should insulate enough. Of course, this should not be done on top of the peak. This technique is even improved when used in a cave but finding a cave up there is rather unlikely. I found this the most comforting counter measure against lightning. If you're really above the treeline you don't have a lot of options. However the best thing is to make yourself as small as possible. This means you should squat down. (The same way you use a squatting toilet). To even improve this, you should only place a small piece of your foot to the ground. The reason for that is, that you should try to minimize the contact area between yourself and the ground. So, if possible stand on your toes. If you have a backpack you should throw it away. At least some dozen meters should be enough. Also throw away all metal things you were on your body. Especially if you're a mountain engineer it is a very good idea to throw away your pickle and don't forget to dismount your climbing irons. The things above you can do if the lightning storm is directly above you. (You can check this by counting the seconds between the lightning itself and the thunder you here. If you can't recognize any time difference between the visual lightning and the sound of the thunder, the thunderstorm is directly above you). If the lightning is a little bit further away (the rule of thumb is: 3 seconds between the lightning and the thunder is 1 kilometer distance from you), I would try to 1) go down as fast as possible 2) or go to an area where you're not the single thing on a relatively flat surface. So a forest would be a good choice, but no single tree! Not the answer you're looking for? Browse other questions tagged hiking lightning or ask your own question. What should I do when caught in lightning while in my tent? What should you look for when buying hiking socks? What clothing or gear should I wear to prevent ticks? What are the best methods for hanging food in a tree? What are these bulges? Are they harming the tree? What to be aware of if lightning strikes close to me? Is it generally safe to hike a pass in a thunderstorm?